Getting the right amount of sleep can be difficult these days. Not only do our modern day schedules demand a lot from us often stealing time from our precious hours of rest, but also if you fall behind on rest it’s difficult to catch up. Sometimes the root of our sleep problems is stress, health difficulties, and the like. However, in many cases, a mattress that is either worn out or not the right fit is most often responsible for restless nights spent counting sheep. 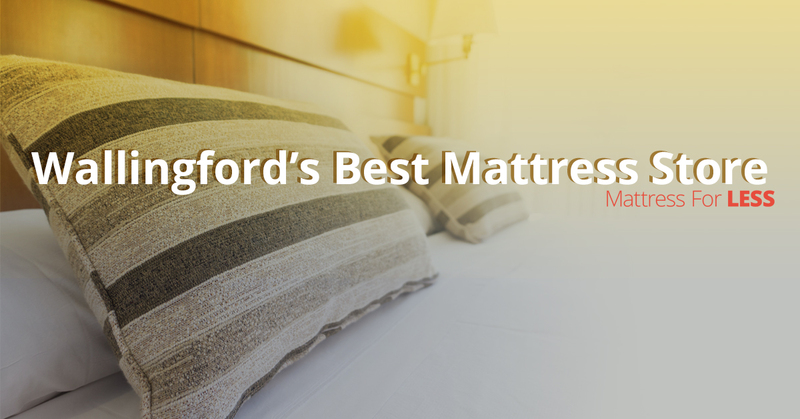 Mattress For LESS is proud to be a part of the Wallingford neighborhood and it is our goal to help our neighbors get the sleep they need and deserve. For that reason, we offer affordable, high-quality mattresses from popular and respected brands such as Sealy, Sealy Posturepedic, Therapedic, Kingsdown, Eclipse, Easman House, Solstice, Body Fit, AmeriMattress and more. In addition to our high-quality mattresses, we also offer other essential bedding of the same caliber. We truly want to help you get the rest you need to handle all the life throws at you and to keep your body healthy and happy. As we mentioned previously, we offer the highest quality affordable mattresses and bedding in the Wallington area, which has earned us the title of Top Rated Local® bedding store. All of the products that we offer are made with comfort and affordability in mind. Not only can we set you up with a comfortable mattress that will have you counting z’s instead of sheep, but we can provide other bedding options that are of the same quality so that you can not only have a place to sleep, but you will have a relaxing oasis. As mentioned above, we offer a range of regular mattresses and adjustable base mattresses from leading and respected brands such as Sealy, Sealy Posturepedic, Therapedic, Kingsdown, Eclipse, Easman House, Solstice, Body Fit, AmeriMattress, Leggett & Platt and more. We also carry specialty sizes such as Full XL (special order) and Twin XL. Whatever your mattress needs, we are sure that there is something for you to get the rest you need when your head hits the pillow. Other bedding that we offer includes headboards, bed frames, mattress protectors, pillows, and more. We are your one stop show for all that you need to create a comfortable restful bed. To learn more about what we carry, shop online or visit our Wallingford location. Have questions about finding the perfect bed? Just ask us! Our sales associates are always here to help you find what you need. Not sure you’ll be able to spend the money on a new mattress? Don’t let money deter you! Mattress For LESS offers zero percent financing and doesn’t require money down or credit. We have payment options that can work with your budget! Ready to stop counting sheep? Stop in to our Wallington location to find the mattress, pillow, bed frame, and headboard that will help you rest peacefully and wake up feeling energized and ready to take on the day. Click below to shop online or visit our store!